Southern Saw Service has been a staple of the Baltimore business world since 1845 when it began as a family owned and operated company. Our goal is simple: to provide businesses with the best quality of service and products available to meet all of their tooling needs. If you are in an industry such as architectural millwork or solid surface fabrication, then Southern Saw has the know-how and the products you need in order to be successful. Throughout our long history as a company, we have always strived to stay on top of the latest industry innovations and provide our customers with the most current technology. Our commitment to expanding our own knowledge translates into benefits for you and your company. There is no one out there with more expertise in the field of CNC (computer numerical control) routing, grinding, and tooling maintenance. We specialize in a wide range of tooling products and services, including solid carbide tooling for your CNC router, such as spiral router bits, compression spirals, and roughing spirals. Additionally, our team specializes in carbide saws, router bits, and cutters. If you are new to CNC routing or need advice before starting your next project, we can help! We would be happy to talk with you in order to determine what tools will best suit your business’s purposes, and will perform all of the necessary maintenance for your existing system. Southern Saw proudly serves the Maryland, Southern Pennsylvania, and Northern Virginia areas with its pickup and delivery services, and can provide nationwide service through UPS, Fed-Ex, and the U.S. Postal Service. We know your businesses needs all of your attention, so let us come to you. Our team will come to your business to pick up your tool. After sharpening the bit, our staff will bring it back to your facility in like-new condition! 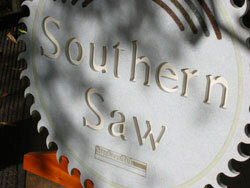 Southern Saw was founded with serving the customer in mind. Let us help you find the right tools for your next job and help you keep them nice and always ready for action. For more information or to find the right tool for your project, call Southern Saw today!